This is the moodiest Warpaint record to date and at the same time their best work yet. It says something for a band that with each release i say, "This is the best thing they have done!" I know that it creates an expectation on my part that they will eventually fail to live up to. I think this is why we eventually grow out of bands -- a misstep leads to tremendous disappointment, which leads to rejection, moving on, etc. So, ahem, well, Warpaint's new record Heads Up is the best thing i have heard from the band to date. How the heck do they keep doing this? I hope that they can keep it up! I thought that their previous record, their 2014 self-titled album, was a moody pop record. Well, for Heads Up Warpaint have decided to make a dub record. No, really! And it's awesome. This time around they worked with producer Jake Bercovici, who worked with them back in 2008 on their debut Exquisite Corpse. He does an amazing job here. Warpaint consistently find excellent engineers and producers to work with, people who allow the various aspects of their instrumentation to shine through. This record is sparse, the drums and the bass given wide spaces to work in, allowing them to echo and reverb dubbily. The voices, guitars, and keys all have their own space. Nothing overpowers anything else, all of the sounds ebb and flow organically. The record starts with a nice scattered drum, the bass slippery and echoed and the guitar a subtle chime. The voices harmonize nicely and they add in some faint organ sounds in the distance. Whiteout is a mellow groove to kick off the record. On By Your Side the drum beat sounds sampled and keyboardish sounds ooze in the background, while the voices are closer, in layers with lots of harmonies. The whole song throbs and oozes along, real bass sliding over echoed keys and that drum machine tap. I like the voices here, as the girls exclaim their solidarity, then the whole song parts for a tinkling bass bit. Lovely. I like this modern take on what King Tubby or Scientist were doing. They kick off lead single New Song with some 1980s synth whooshing, and Stella Mozgawa throwing in a really swinging drum beat. The whole song moves along happily, pulsing and skipping along. It's really catchy, and it tends to stay stuck in my head. The Stall starts with a scattered drum bit and an awesome post-punk bass riff, Jenny Lee Lindberg channeling The Cure. It gets really swinging with that awesome bass riff, the drums tapping, and the guitars grinding. Another really great tune, with lots of interesting layers sliding around including a lovely piano bit in the middle. Current favorite song So Good starts with Mozgawa beating a metronomic beat while Lindberg thumps a deep throbbing pass riff as the guitar picks out a trebly post-punk solo. This makes me want to get up and ska dance, but they add in more layers, guitars intertwining, voices harmonizing, keyboards whooshing. It all moves at a great pace, just a happy swinging danceable song. In a weird way, it reminds me of Underworld's classic Second Toughest In the Infants, especially in the pulsing keyboardy interlude in the middle – this song has that same sort of echoing organic dance music feel to it. 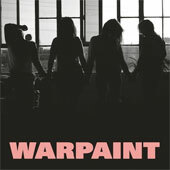 Warpaint slow it down for Don't Wanna a sparse song consisting of a ticking beat, a rubbery bass, and layers of voices. As it grows, it gets a little denser, but it is still mostly just voices and that clicking beat. On Don't Let Go guitarists Emily Kokal and Theresa Wayman start the song off by trading mellow guitar riffs that sound like the interplay on a July Skies record, all light and airy. They start singing, and one of them plays a riff that reminds me of Houses of the Holy-era Page, and then the drums come in, a really forceful jarring beat. This song, of all of the ones here, reminds me most of the moodiness of the previous album. Warpaint go full electronic on Dre, with booming sampled beats that clatter, whooshing synths, really deep bass, and layers of echoed voice. It'd a song that has some of the moody darkness of most dubstep. Heads Up starts kind of the same, with echoed voices harmonizing over a sparse piano bit. But then Mozgawa and Lindberg kick in with a happy riff and the guitars pick out a trebly Wire-ish riff. Another really catchy song. An electro beat and a tinkling xylophone sample loop in Above Control. When the voices come in, they are singing long notes slowly and mournfully, all of it dripping echo. I really like this one, it's a strange darker kind of song though, with Warpaint getting back to their dreampop roots. The final song on the album is Today Dear, a haunting folk song of tinkling guitar and vocal harmonies. They ended their pervious album in a similar way, with a sparse quiet sad song. Huh. It's not my favorite here, but i think it brings the record to a natural conclusion. I like this record. A lot. It's about an hour of music, and it rewards repeated listens. Warpaint are doing interesting things with rhythms (how could they not with such talented performers as Lindberg and Mozgawa) and harmonies (Wayman and Kokal work together so effortlessly). Once again, i am very impressed. I can’t wait to see what they do next, but i know that i will have to wait a couple of years for the next release. There is a lot to listen to in Heads Up, and it will tide me over for a while. You should go and listen to this. Really.